Observant readers will have noticed that I was very quick on my hiking trips in the last 16 months. That had less to do with an increase in fitness and speed on my end, but more with the colour of my shoes. It is a well known fact that red shoes make you walk faster, so the increased speed is due to the Inov-8 X-Talon 190 I was wearing. And while this is structured like a living review, these sweet trailrunners are nearing the end of their lifecycle, and might soon need to be brought to the place where trailrunners go to run on the eternal fjells. But before that happens, lets take a look at them. I received the Inov-8 X-Talon 190 in May 2012. I first wore them to my Wilderness Guide examination, and they have been on countless trips since. All in, I have hiked & walked & run close to 1000 km in them. I still use them, but will need to replace them soon. They’re shoes. They protect your feet from sharp stones, dust, debris, nettles and mosquitos. They also give you sweet grip on muddy trails, wet stones, protect your feet & give you grip when fording a river, and also work well on snow and any other terrain I’ve encountered. It’s probably their lack of features that make them so good. Minimal cushioning makes you feel the trail you’re walking on, which means you have superb ground contact and can “feel” the terrain you’re walking on; something that I find positive when scrambling on rocks or jumping from boulder to boulder. When it is wet you can almost dig your toes into the mud, though their superb grip - thanks to the aggressive profile - does a good job on its own already. The X-Talon 190 is flexible. Flexible as in you can fold the shoe double flexible. I really like that, and prefer it much more than a stiff sole. The upper of the X-Talon 190 is super flexible mesh, pretty much all of it, except a tiny bit of a toe box (which does the job). That mesh is breathable - so breathable that when I go really fast on my bicycle that I can feel the wind on my feet! It also means that you’ll get wet feet in the rain, but on the plus side that they dry super fast. Talking about how a shoe fits is always fun. The majority of people have two differently sized feet, so imagine me describing how a shoe fits my feet can help you. Ähem, yeah. I’ll try, though. 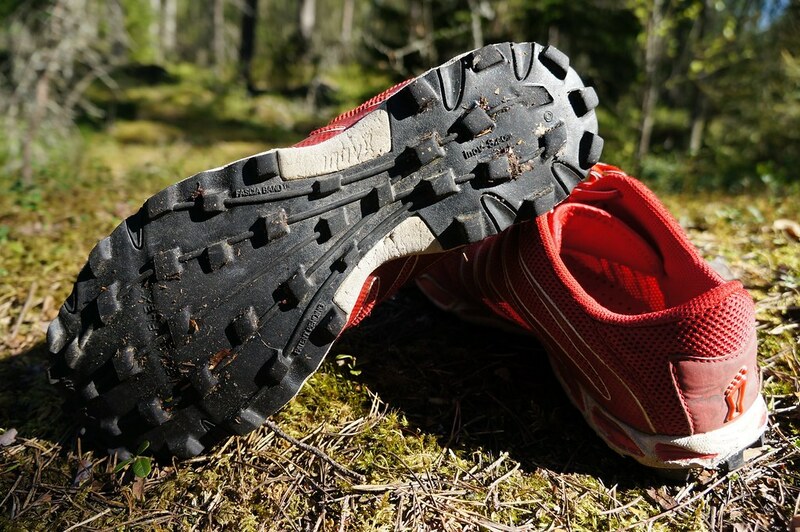 I have a UK Size 8.5 which is the usual size I have in Inov-8 shoes, and they fit my normal/ narrow feet perfectly. That two-way stretchy mesh upper is giving a snug fit, with plenty of wiggle room for my toes. Wiggle room for my toes is important. The heel cup sits tight and low, and yes, it fits wonderful for me, too. I have worn the X-Talon 190s laced up tight and very loose, and in both configurations, the shoe sits great on my foot - both when walking and running. So how would they fit you? Because of that stretchy mesh upper, they have the possibility of extra space and apparently can comfortably accommodate also broad feet. Or so is my theory. Which I have backed up by reading reviews from people with broad feet. I know I know, usually on the Terrocs are fine for broad-feeted folks, though I think these could work because of the stretchy upper. Sticky rubber sole is sticky. Meshy mesh-upper is super breathable. Flexible shoe is flexible. Nope, no technical innovations, I’d say. 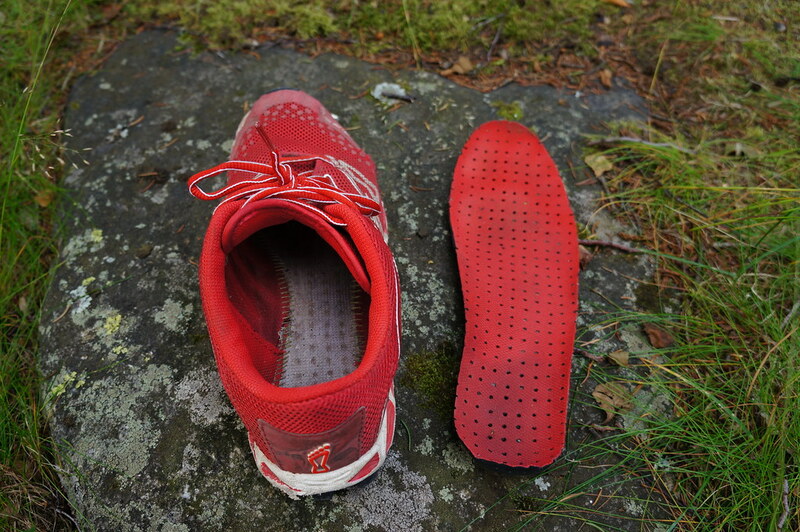 But Inov-8 is the first company who has put these ingredients together to create a very good, very light shoe. btw, Inov-8 says the sticky rubber on the sole of these shoes is similar to the rubber used in climbing shoes. Despite what you might think when you see the photos here, I can’t fault the quality of these shoes. 16 months of use and still going strong is good quality in my book. Sure, the aggressiveness of the lugs is less, they’re not as sticky & rubbery as they were at the beginning, but they still give me decent grip and are comfortable to walk in. I think you’re getting an excellent pair of shoes for your money. 221 grams per shoe. That makes them 442 grams for the pair, in said UK Size 8.5. They’re the second lightest shoes I own my (my Vibram FiveFingers KSO are the lightest ones). Inov-8 has a nice little story on their website entitled “Inov-8, the environment and climate change”. 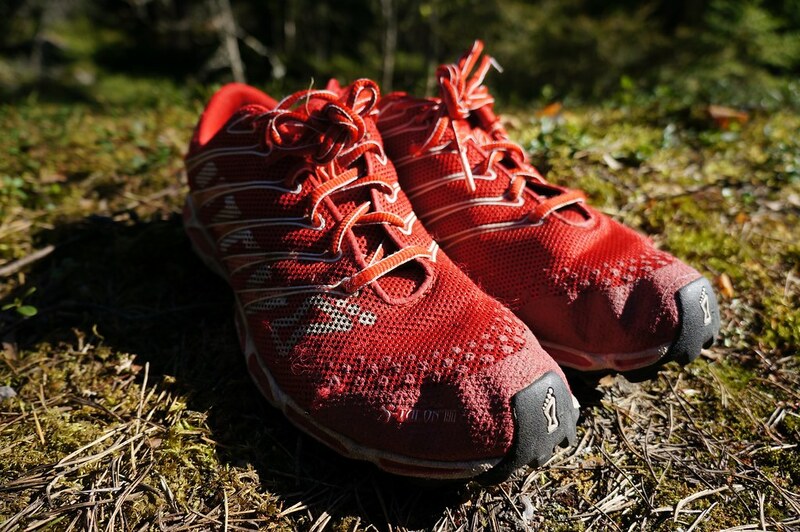 Inov-8 has undergone an Environmental Footprint audit, and they tell us about their carbon footprint (Surprise: Shoes & packaging account for only 17% of it - the biggest impact comes from staff travel). It reads nicely, but remember that this is still a product made from non-natural materials (I’m not sure if that’s right for the rubber, which might be natural?) and it won’t degrade easily if you throw it away. I also am not aware if Inov-8 offers any take-back of their shoes for recycling, or if there’s such a thing as shoe recycling. Another aspect is the ethical question. The shoes are made in China, though that happily nowadays is more positive than in the past. Inov-8 also tell us about their Manufacturing Ethics, in which they highlight that there’s no child labour involved in the making of their products, and that employees are paid above average salaries; as well as some other stuff. All in all I applaud that Inov-8 are transparent in their communications about these matters, though I’d welcome to see a Name & Email there for interested people to contact them, as well as an indepentent source of the provided information for even more transparency. A hard question, and one I should be able to answer soon - the shoes are close to being retired. I know that there are containers here in the city where you can bring old garments and shoes for recycling, though I am unsure of where they then end up. 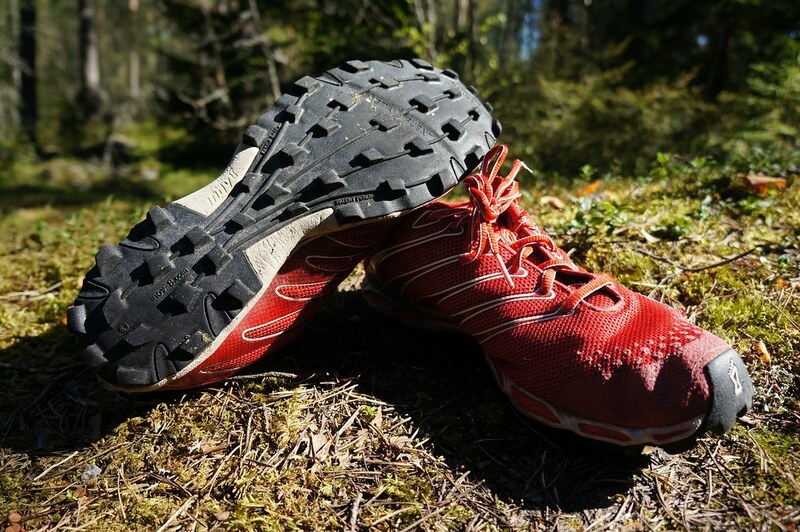 Besides Inov-8’s own Bare Grip 200 and other models there are numerous competing products: There’s the La Sportiva C-lite 2.0, the Salomon Speedcross 3 (more on them in the future), the Vivobarefoot Neo Trail, among others. These all are heavier, though, and not as breathable. 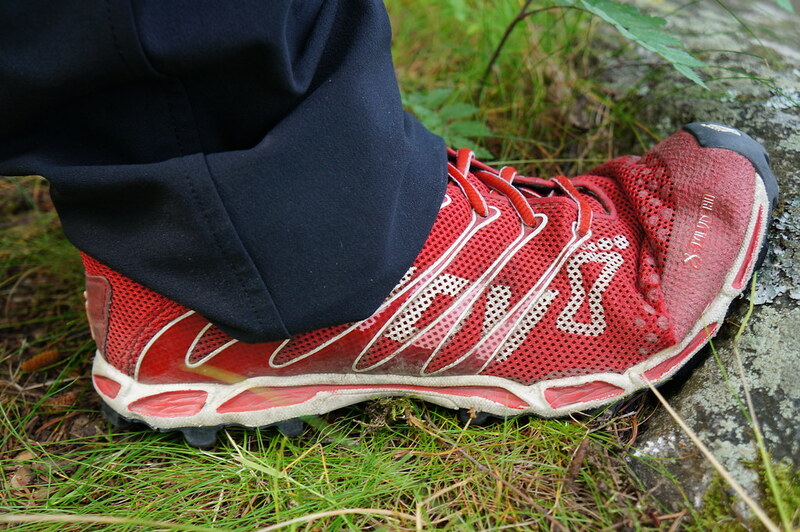 Markus loves his X-Talon 190s for hiking in the Alps and trailrunning. Tom Caughlan from iRunFar.com also think they’re excellent for trailrunning in the mountains. 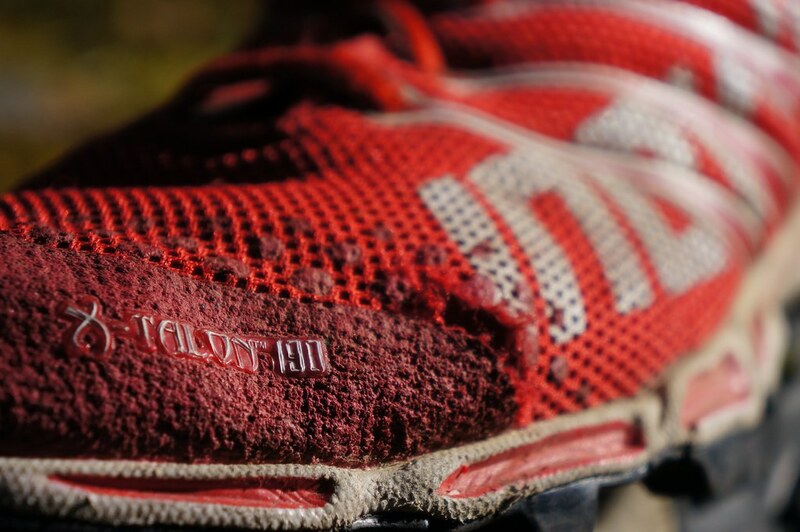 As I said, and as you’ve seen from my photos, my X-Talon 190s are close to the end of their lifecycle; yet I still use them almost daily - they’re just too comfy and when I head out I happily slip into my fast, red shoes. So while I have replaced them for the moment with a pair of (slower) blue Salomon Speedcross 3 which hopefully arrive in time for the Ultralight Summit, I am looking for good a good deal on these shoes to get a new pair. 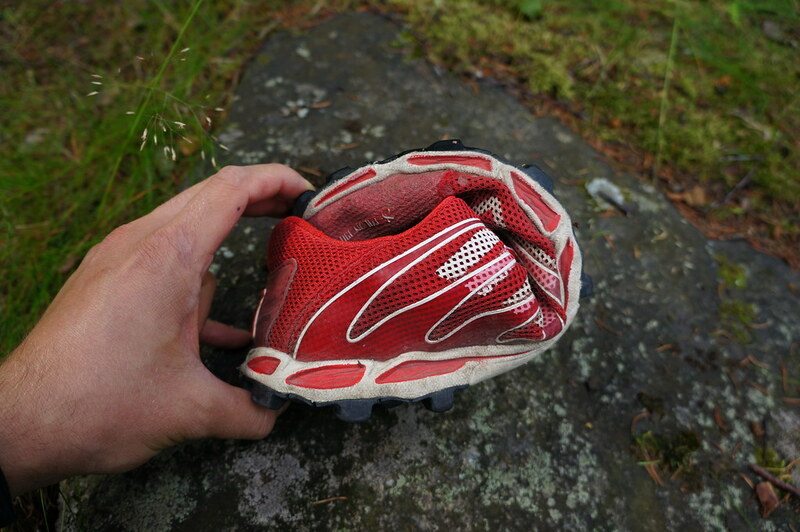 Except in (our cold Finnish) winter the X-Talon 190 are perfect for three season ultralight backpacking - great grip, comfortable, breathable, quick drying. If you’re in the market for a new pair of shoes, then consider these. If there will be a next update, then I will report on how they were recycled.